Missing someone is so hard but having I miss you quotes can sometimes ease one�s pain. Even if its only to remind them that they are not alone in this! 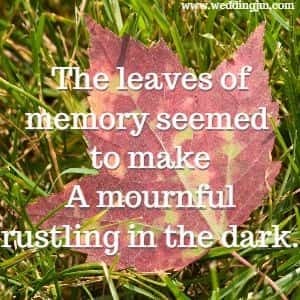 Below you will find some quotes about missing someone special. We hope you find them helpful. To be away from you will be the hardest thing I ever do. But I also know in my heart, we will meet again. No one knows how much I miss her, No one knows the bitter pain; I have suffered since I lost her, life has never been the same. Our hearts today are sad and lonely, And our thoughts are always of you; How I loved you and how I miss you, No one but God in Heaven knows. Dear Husband, how I miss you, This world will never know; If tears could have brought you home You would have been here long ago. My lips cannot tell how I miss her, My heart cannot tell what to say. God alone knows how I miss her, In a home that is lonesome today. I hate knowing that you are not here. I wish I could make you come home again. I never realized missing someone could physically hurt, but thats what missing you is like for me. How I wish you were here with me now. I know you wish the same and in some way, that is comforting. Some day we will reunite and then we can pick up from where we were. As close as two friends can get. I miss them too, probably not as much as you, but I do miss them too. I'm told I'll move on, that the image of you will fade and it will get easier, but all that does is make me sadder. I hope you never fade from my mind! I don't think I really knew I'd miss you as much as I do, yet here I am and I really miss you. You know I think I miss your attitude the most. The way you knew exactly who you were and knew how to remind me of exactly who I am! 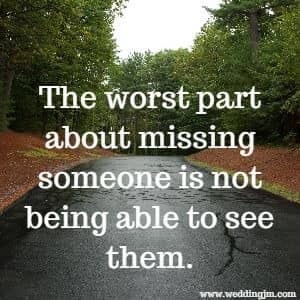 The worst part about missing someone is not being able to see them. I miss you in a simple way that means so much to me. I simply just miss you and everything that stands for. When I think of you, I feel like there is a piece of me missing. You are that piece and I hope someday it will be replaced. There is nothing that I can do to keep myself busy enough for you not to cross my mind. One thing I know for sure is how much I love you. If I didn't, I wouldn't miss you this much! Don't worry, I only miss you when I'm awake! Thats not true...I miss you in my dreams as well! I find it difficult to understand how it is possible to all of a sudden not speak to someone you have spoken to every day of your life and not miss them! I miss your laugh, your smile and your ability to know exactly when I need to hear it and see it! If you were here, I'd tell you that I'm going to be okay. Maybe that would help me to believe it too! I see you in my dreams, I hear you in the wind, I feel your touch when I close my eyes. I can only hope that I am missed as much as I miss you someday. On the days when the sun didn't shine, you did in its replacement. Now, the sun doesn't shine as much as it use to.